Guys, I have a problem: I am addicted to Halloween stuff. This isn’t even logical. I am moving my entire life to Australia and all I want to do is load up on all the Halloween stuff from Michaels. The first week I was in my new pad, I discovered there was a grocery store within walking distance. Victory! So, one day, when I was joyfully unemployed and had the whole day in front of me, I thought, “I’m going to take a stroll down to Star Market and pick up x, y and z”. It was sunny and warm and I was in good spirits. I got to the plaza and to my shock, the entrance to Star Market was right smack dab in the middle of TWO entrances into Michaels. Well, that’s convenient…I guess. I do need to get spray paint…I guess. 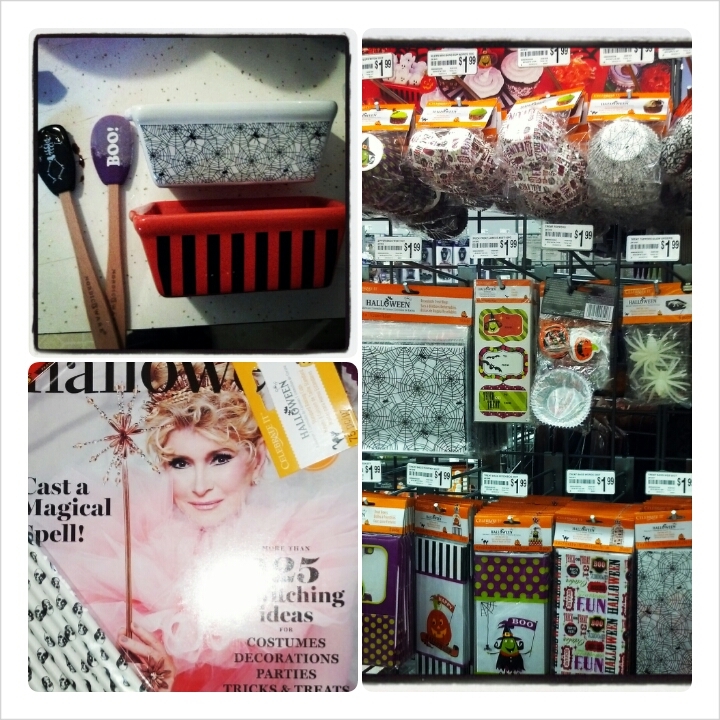 So into Michaels I went. I just need white spray paint, I said. I just need white spray paint. Then, I descended the stairs and there were all the halloween decorations. I was unprepared for the Halloween onslaught! My defenses were down!! I was vulnerable!!! I wasn’t prepared to say no!!!! The next thing I knew, I was in line with a basket full of halloween stuff and an hour of my life was gone. Wait, what? What am I buying? Scrapbook paper? A book of pumpkin carving patterns? A count down calendar to Halloween when I am not even going to be here for Halloween?? I had to take a deep breath and do some seriously editing. Clearly. I settled for the world’s cutest paper straws with little skulls on them, the Martha Stewart Halloween magazine (It’s like getting the Toys R Us magazine when you were a kid, SO EXCITING! ), two mini loaf pans and a little ramekin. And some cupcake liners, which I forgot about until I looked over my instagram photos for this grid. Whoops! Trust me, that was edited! Then, I had the difficult task of actually utilizing said Halloween items because, clearly, I needed to justify the purchase of them! Say hello to these mini pumpkin loaves, the cutest way to eat pumpkin! 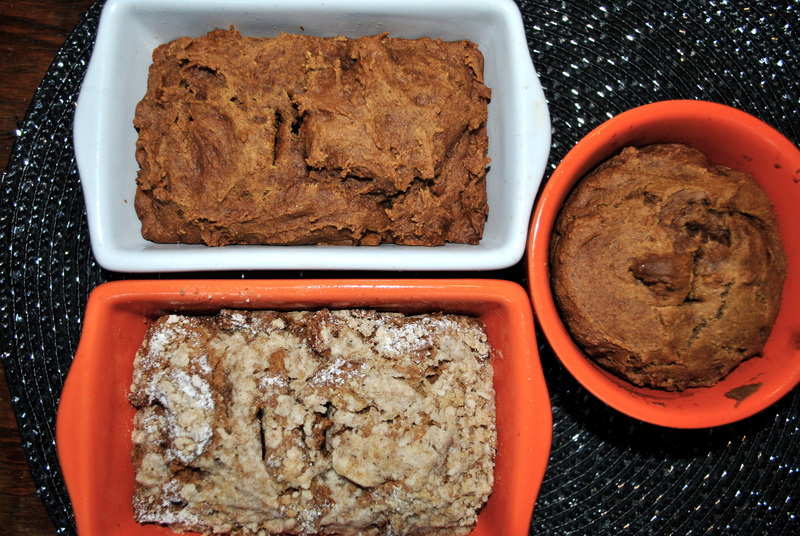 I made three versions with one batter: regular pumpkin bread, pecan streusel pumpkin bread, and chocolate chip pumpkin bread. In a mixing bowl stir together the flour, sugar, pumpkin spice, baking powder, baking soda and salt. In another bowl, whisk together the pumpkin, molasses and oil until smooth. Make a well in the center of the dry ingredients and pour in the wet mixture. Stir together until completely mixed. If the batter is too stiff to mix, add a very small amount of water to loosen it a bit, but it should remain thick. Divide the batter among three lightly oiled mini-loaf pans. If you are adding the optional streusel, mix all the ingredients together with a fork until everything is well incorporated. The butter will remain crumbly. Layer on top of one loaf (or all three if you choose). If you are adding the optional chocolate chip, stir it into one of the loaves. 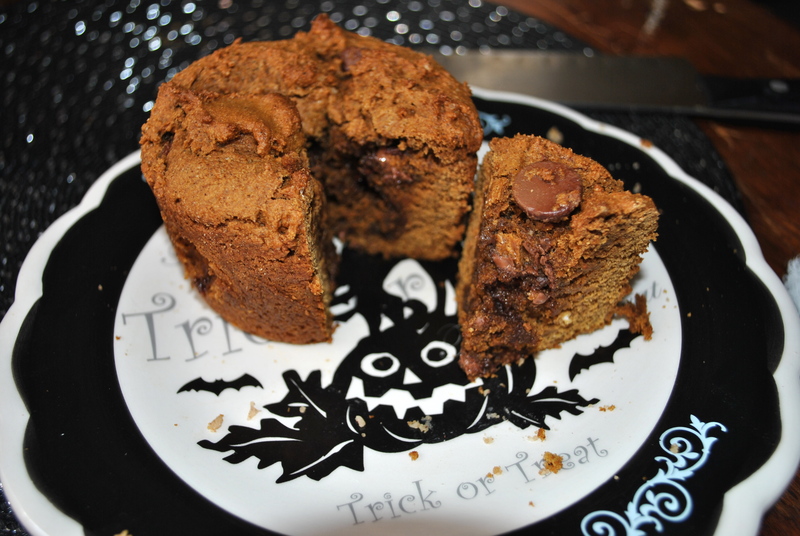 (if you want to make all three chocolate chip pumpkin, stir the chocolate chips in before you divide the batter). Bake 20 to 25 minutes, or until a knife inserted into the center tests clean. These are so, so cute. I think the chocolate chip and the streusel are tied for my favorite. 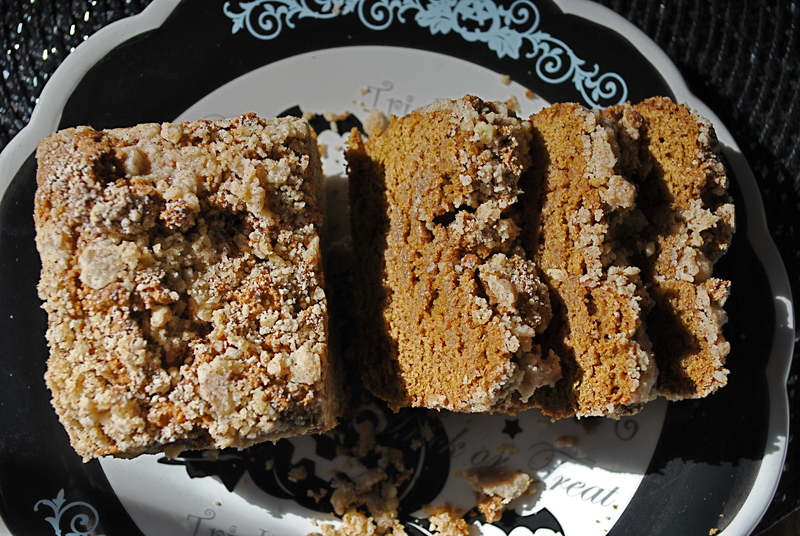 The toasted pecan streusel is perfect with the pumpkin and the chocolate, is, well, chocolate. Everything is better with chocolate! Go make these pronto. They’re too cute to pass up. Also, if you go to Michaels to get these, let me know what else you get! Cause you know you can’t leave there with just the things on your list. 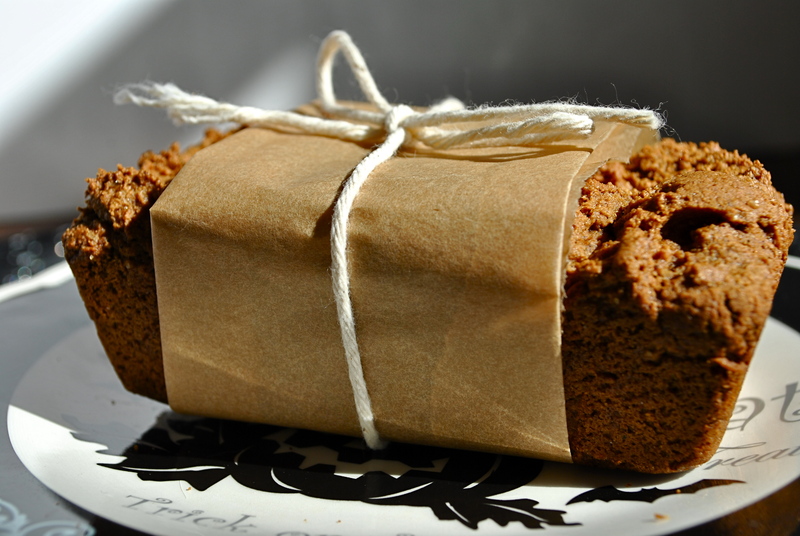 I love to make pumpkin bread but never thought to add streusel-clever! I can’t wait to try! Thanks for sharing.